Standing Wave is a six-member contemporary chamber ensemble, three of whom (Christie Reside, Rebecca Whitling and Vern Griffiths) perform regularly with the Vancouver Symphony Orchestra. Making up the other half are jazz cellist Peggy Lee, pianist Allen Stiles and clarinetist A K Coope who is frequently seen and heard with Turning Point Ensemble. Standing Wave specializes in playing music that is highly technical and yet ethereally organic. It would be difficult to define their programmes as New Age since they occasionally perform music composed in the middle of the last century. Point of fact, their first selection, Olivier Messiaen’s Le merle noir (The Blackbird) was first heard in 1952. Messiaen’s chamber work was initially arranged for flute and piano, but the interpretation we heard last Sunday (27 May) was transposed by Jennifer Butler to include clarinet, violin and percussion. The arrangement felt at times as if it was entirely improvised, but in fact faithfully followed the noted score. Arguably the most pastoral piece of the evening’s selection and certainly the most richly evocative was George Crumb’s Vox Balaenae (Voice of the Whale). The trio of flute, cello and piano wore the composer’s requisite face masks created especially for this performance by Nisga’a artist Mike Dangeli; the idea being to de-humanise the performers and thus shroud the music in a certain mystic. The piece truly emulates the cries of the hunchback whale and yet probes a range of timbres with marked finesse. With Michael Colgrass’ curiously titled Wild Riot of the Shaman’s Dreams, flautist Christie Reside offers a master class in the flexibility of the flute. Inspired by Farley Mowat’s story People of the Deer, Reside took the audience on journey through the forbidding Arctic tundra. 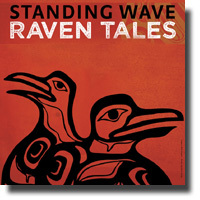 The main item in the evening’s programme was a first public performance of Raven Tales by Marcus Goddard, a five-part suite inspired by Dangeli’s painted drums that were hanging in the Cultch’s Historic Theatre. The music is based on a supernatural being known by the Nisga’a as the Txamsem, a shape-shifting character who sometimes embodies the raven. The first two movements were meditative and sombre, but the tempo moderated with the jazz inflected third aptly titled Trickster. The elaborately structured fourth and fifth movements return to a more soulful cadence. Special guests Git Hayetsk Dancers led by Mike Dangeli and his wife Mique’l opened each of the two sets with a performance of aboriginal dances: Down Spreading Song and Victory Song.